Welcome back! The website - it's new! 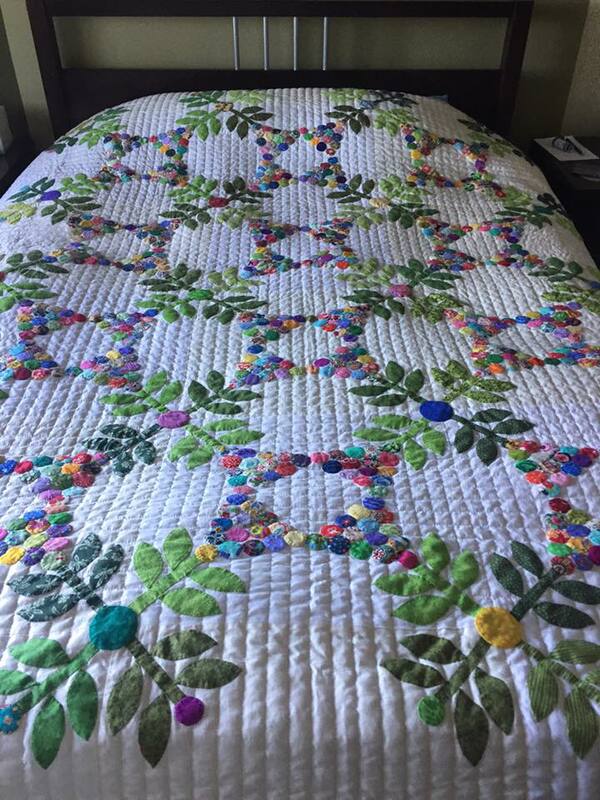 The quilts - they're updated! 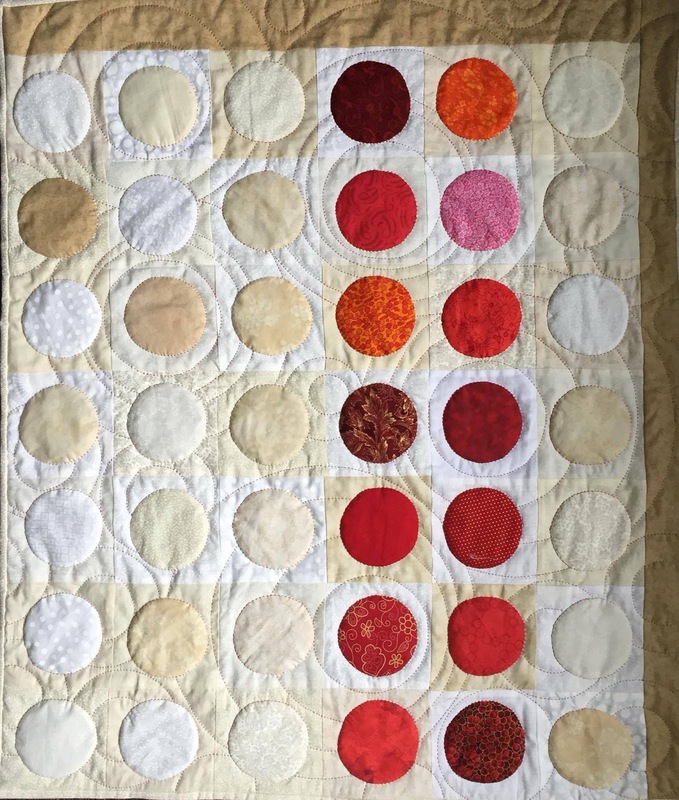 After I finished the blue on neutral "Dot, Dot, Dot" quilt I decided to do it again, this time in reds. And vertical. 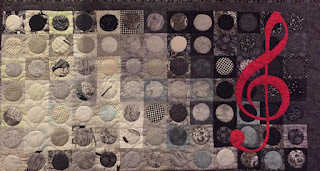 So in my usual uber-creative way of naming quilts, of course this one is called "Vertical Dot, Dot, Dot". 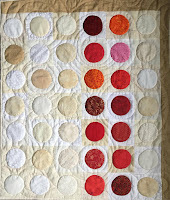 It's 25½" x 30", a little bigger than the blue one, again with backgrounds and circles ranging from white to light tan, then the feature circles in pinks, oranges, and mostly reds. 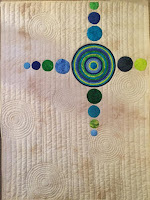 I quilted radiating circles into the background, and in the ditch around each appliqued circle. I do some volunteering with a few different organizations, one of which is Canuck Place Children's Hospice. 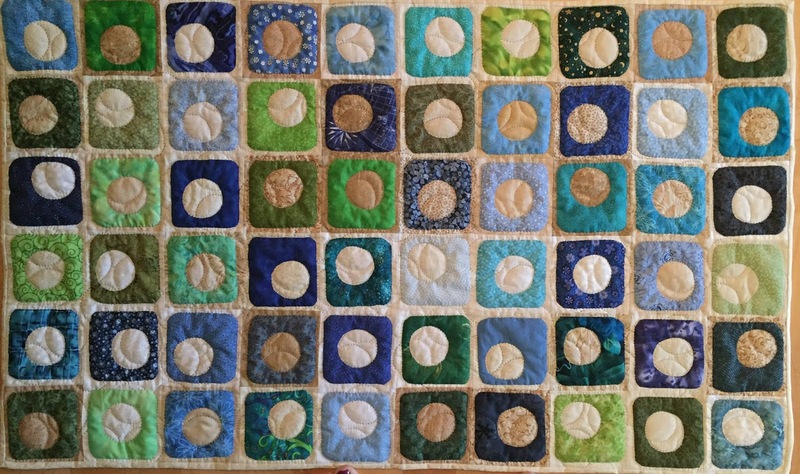 So far I've made and donated 4 quilts to them, and decided it was high time I did another. I don't work with pastels very often, and I have a very small supply of 30's repro prints, but I do love the look of them. 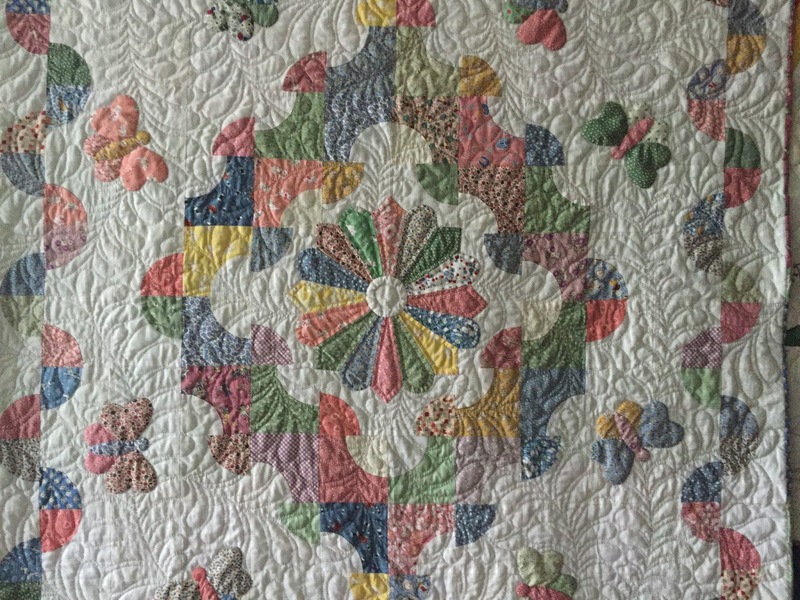 Every time I use them I vow that I'll do more repro quilts, then it's years before I actually do it. This one I designed myself, using one of my most favourite blocks: Drunkard's Path. I alternated using the prints as the quarter circle and the background to create the undulating pattern around the Dresden Plate in the middle. Heart-winged butterflies are randomly placed to fill in the white space. It's machine pieced, but all of the applique and quilting is done by hand. 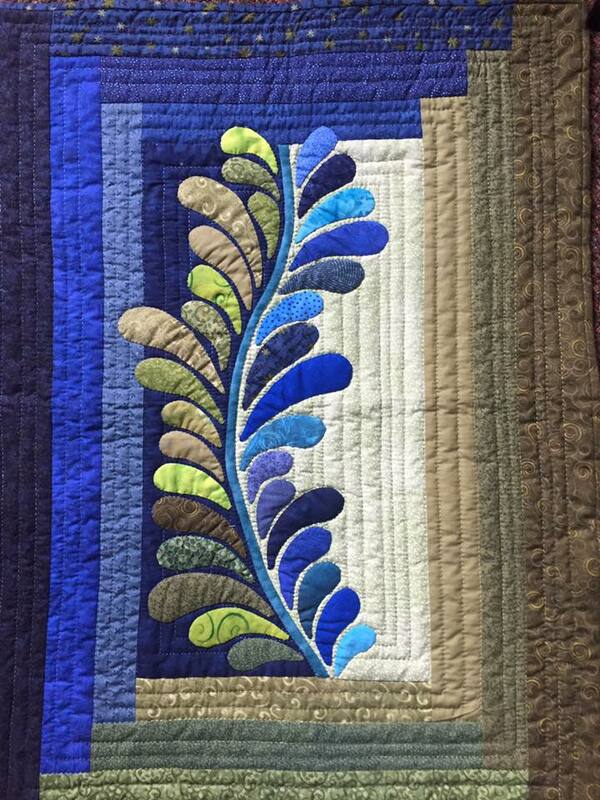 I quilted feathers throughout the whole thing. It was inspired by the daughter of a friend of mine, so I named it "Feathers for Megan". It's 45" x 54", took about 4 weeks to quilt it. I love the sea. I can't imagine living anywhere that I can't readily see or smell the ocean at any given time. I also love the colours, all the blues and greens, they calm my heart and settle my soul. And if you've been paying attention, the only thing I love to quilt as much as circles, is feathers. So this is "Seaquine". It's 19" x 31". The background is actually a fair bit bluer than it appears in the picture. Once I finished the runner (actually more like while I worked on the runner, who really just works on one project at a time?) I decided on a wall-hanging to make for my cousin's kid's wedding. I always want to call him my nephew, because we're more like sisters than cousins, but technically that wouldn't be right so we'll leave it be. Anyhow, he got married in June 2016 (I can't believe I'm really that slack at posting my work lately) so here's what I came up with for him. I'd made a version of this in reds and a bit smaller, but I like this one much better. I may end up making it again for myself. It's called, of course, "Live, Love, Laugh" and measures 16" x 35". I then decided to get back to my all-time favourite: circles. I first made "Squircles & Circles" in my blues and greens on neutrals, then loved it so much I had to make it again, this time in neutrals on neutrals. I love them both and really want to make another one, but nobody has bought either of these yet and I really don't need that many versions of the same quilt lying around the house. For anyone who doesn't know, a Squircle is a real thing ... it's a square with rounded "circle-like" corners. 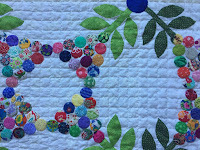 The background squares are 4½", so I made the squircles just a tad under 4" so there would still be a bit of background around them after they were pieced, then randomly placed a circle on each squircle and carefully cut it out to applique down and let the background peek through. Each of these quilts is 39" x 24". Then I was watching a program on History Channel about crop circles. I've always been fascinated by them and always thought they'd make a neat quilt, so here we have "Concentric" which is vaguely inspired by that. Yes, more circles and more blue and green. It's 28" x 38". 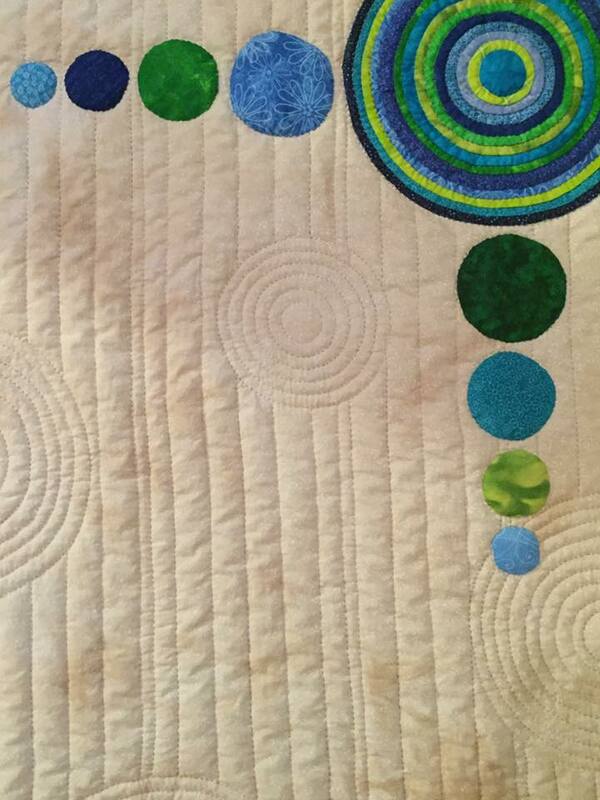 I started with the small centre circle, appliqued it to the next colour, cut it out to the size I wanted, appliqued it to the next, and so on until I had the size I wanted for the main one, then added the satellites around it. 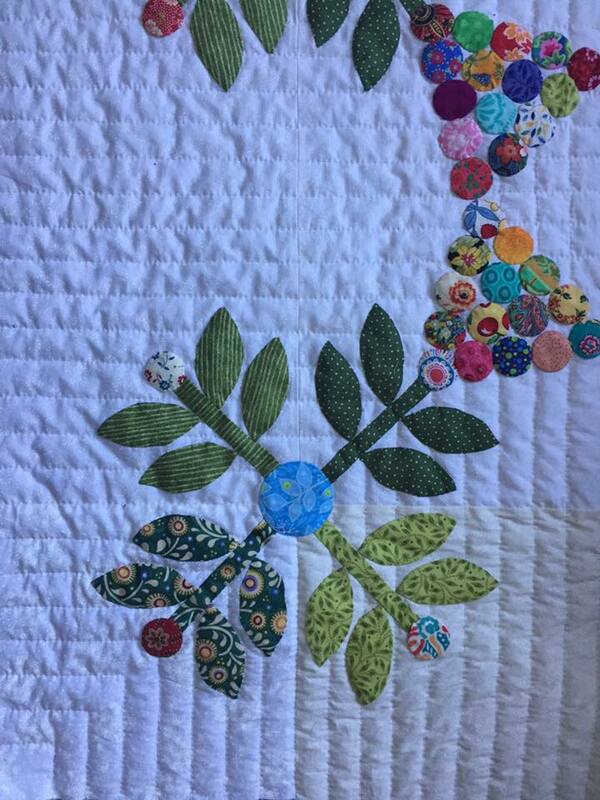 I appliqued them all to a piece of muslin that I tea-dyed, then hand quilted it with variegated tan thread. All my life I've been a sucker for inspirational posters. You know the ones, like with the kitten hanging from a thing that says "Hang in there!". 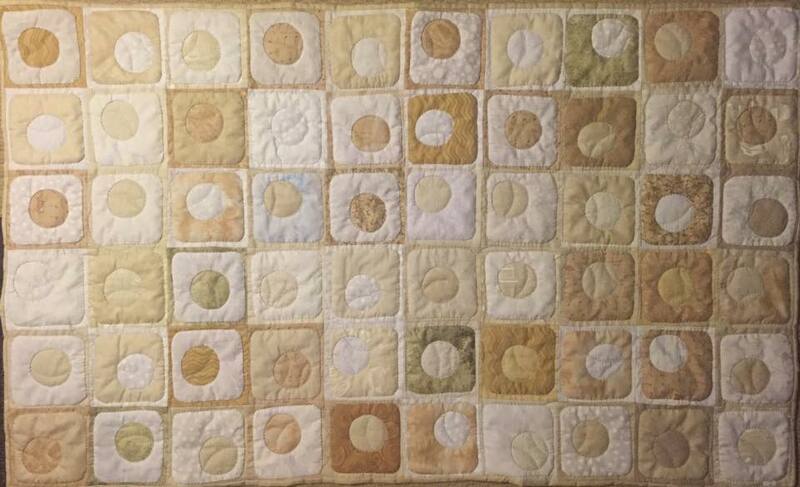 I've recently been making quilted versions. I've made a few in the past, but this is the first one I've really liked. 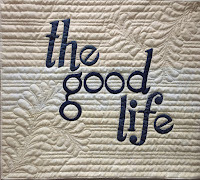 I found this font online a while back and have used it over and over again.... it's easy to read and easy to sew and looks great. 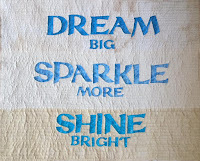 "Dream, Sparkle, Shine" is 33" x 27". 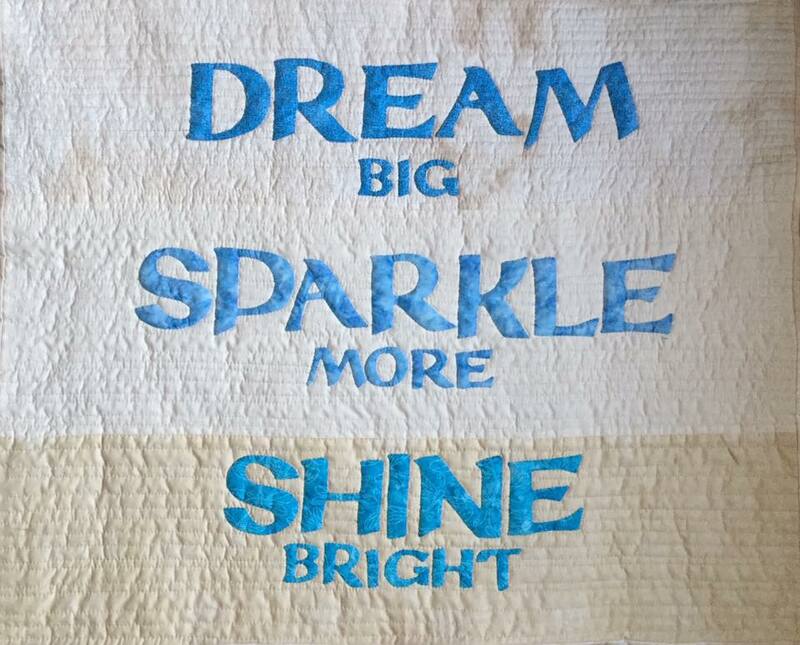 I used a sparkly blue fabric for the words "sparkle more" (so whimsical, I know!). 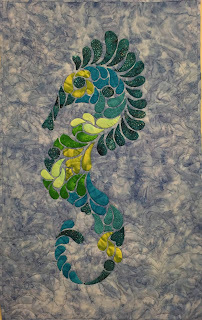 I used 3 different neutral bands of background fabric, hand quilted horizontal lines throughout it. Besides blues and greens, believe it or not, I do like other colours. For example, red on black is always stunning. And I love symbols like the & quilt I made a while back, so this time I went for the musical clef. I don't generally collect a lot of blacks, so I had to dig deep into my scrap bin to find enough to make this one. "Fade to Black, Cue the Music" is 50" x 28". I'm into giant things lately ... makes me feel all artsy fartsy. 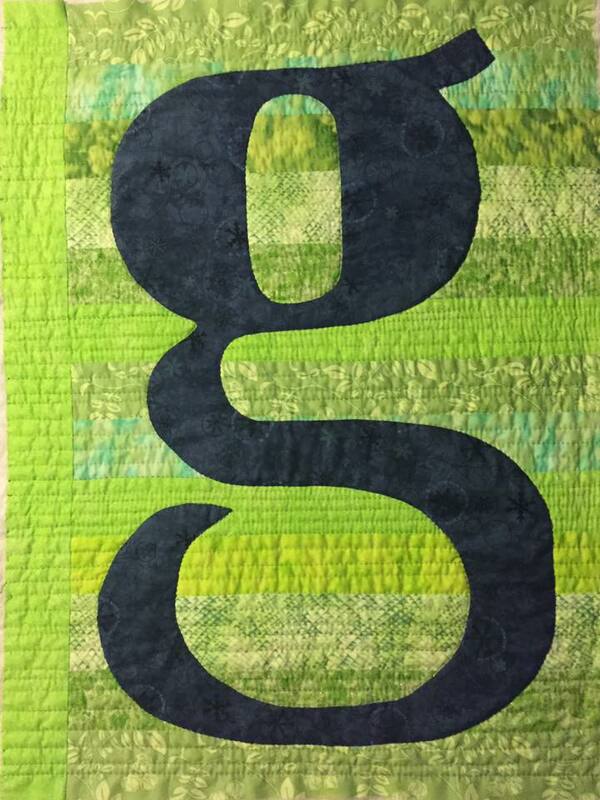 Since my last name is G I made this to hang in my bedroom. 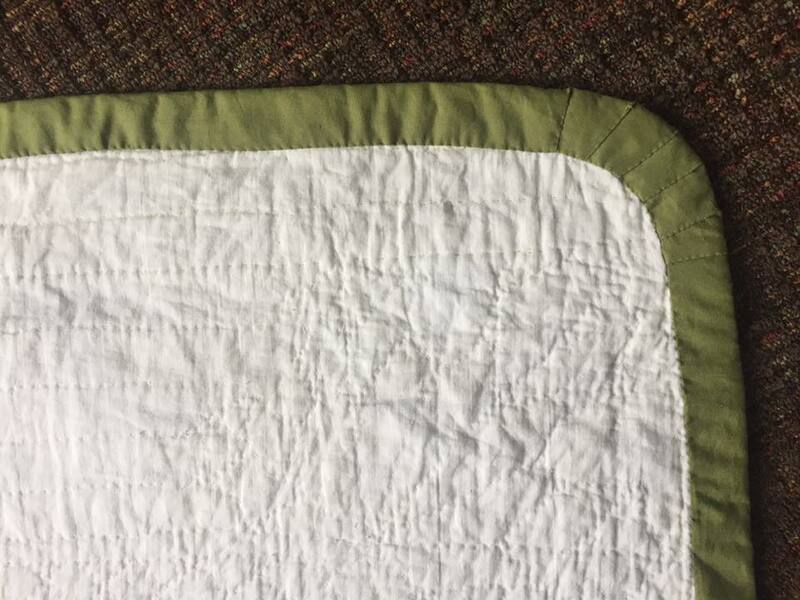 I used a number of different lime green strips of varying widths, then had to put a long one down one side because it didn't quite turn out to be quite wide enough for my liking. I drew out this g freehand - no pattern! I'm quite pleased with myself for that ... yes, I've been writing g's all my life, but it's quite different when you need one to draft a pattern from, getting it all symmetrical and everything. It looks black but it's actually navy. Of course it's machine pieced, hand appliqued and hand quilted with green variegated thread. "G" is 19" x 26". Then autumn came along (yes, fall of 2016 ... I'm not THAT far behind) and I finally got around to making a pumpkin runner for my coffee table. I've been literally saying for years that I wanted to make a blue and green pumpkin runner for the autumn and I finally did it. I have an orange ceramic pumpkin I got from Pier 1 a few years ago and just love the shape of it, so I used it as inspiration for the pumpkins. "Blue-green Harvest" is 37" x 18". Melissa now has her own kid. I had made him a baby quilt when he was born, and now that he's gone from baby to little boy I decided to make him a name banner. "Amos" is 35" x 15" in blue and green on tea-dyed muslin with a nuts print (as in nuts and bolts, not tree nuts) in the border. 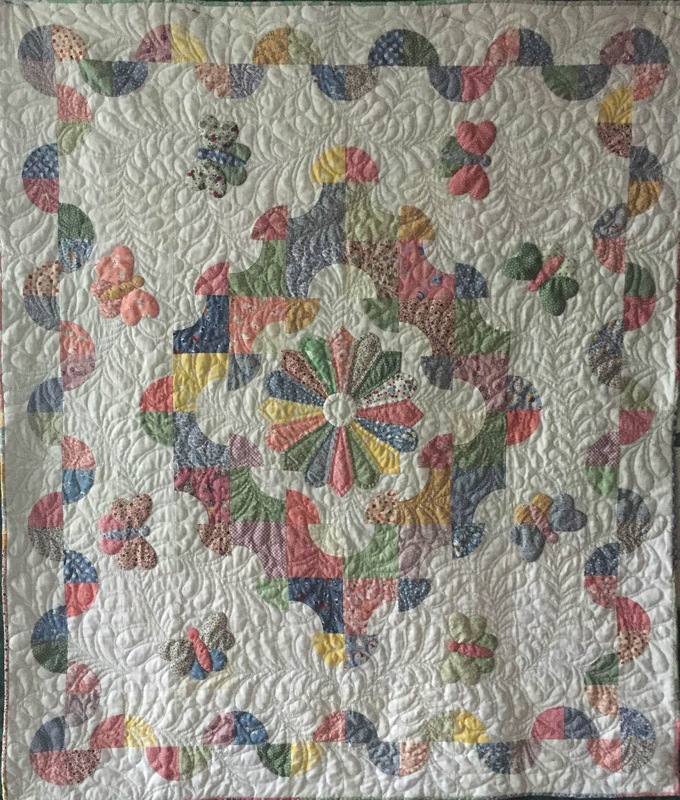 I quilted hexagonal nut shapes into the background with variegated multi-colour thread. 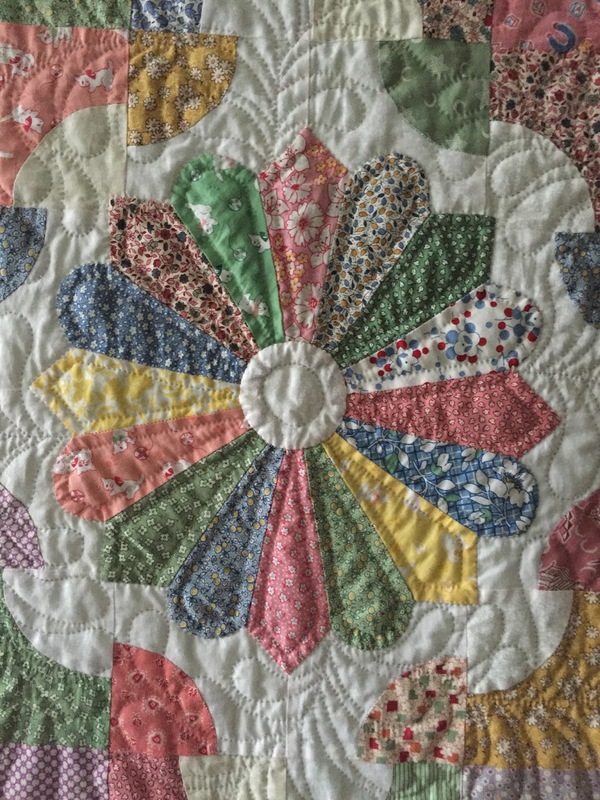 I have this great book, "Fast, Fun, & Fabulous Quilts" and it's just jam-packed with really neat smallish quilt patterns. I've made quite a few from it, actually, but none recently. One of my favourites is also one of the simplest. It's made with a basic 9-patch, they did it in 1" squares for a completed quilt size of 27". 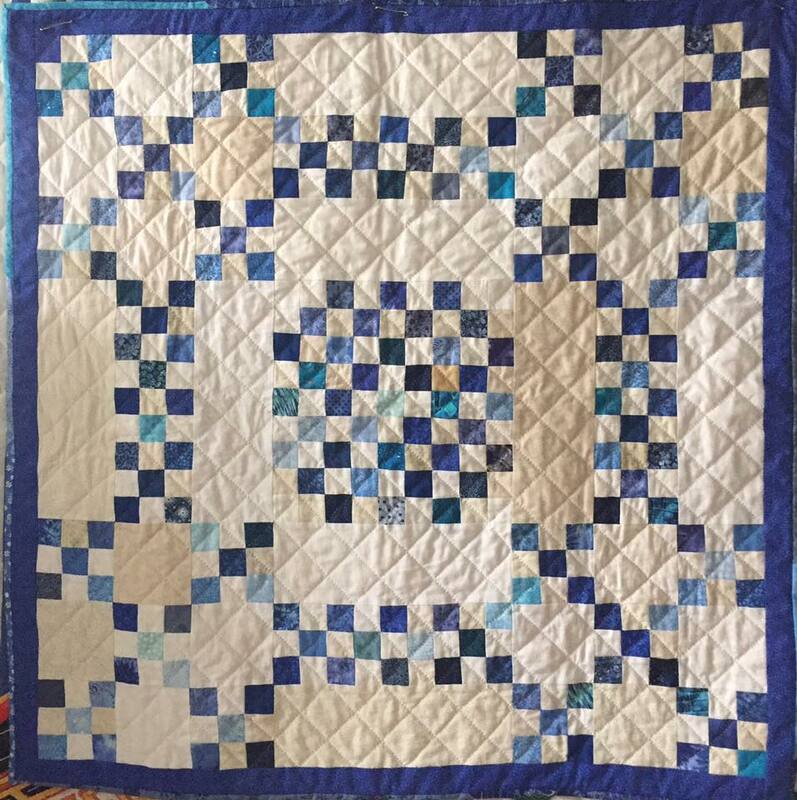 I've made it before exactly as instructed, and now decided to do it again, but this time I used 1½" squares for a completed size of 36". I used a variety of different white, cream, light tan backgrounds and of course scrappy blues. I quilted it diagonally in a cross-hatch design. Earlier I'd said that my kinda nephew got married ... well, just after New Years 2017 his sister also got married. She's more of a modern type person, likes simple things, and when I asked her mom told me she likes navy. 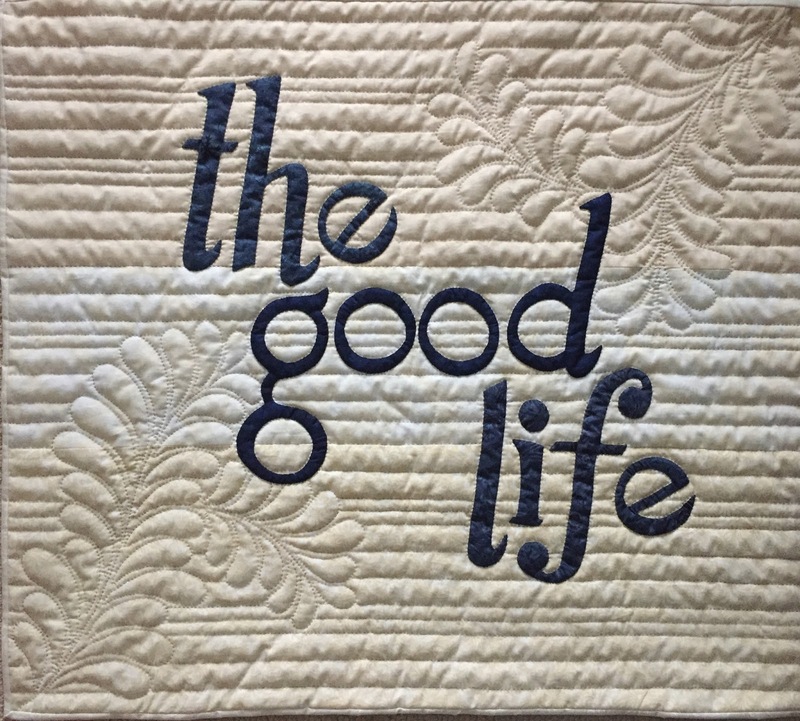 I watch a lot of home reno shows and had seen a piece of art on a wall that said "The Good Life" and thought it would make a fantastic quilt, so this is what I did for Carrie's wedding present. It's 30" x 26". I drafted the font myself, used 3 different light background strips and 3 different navy blues for the letters. 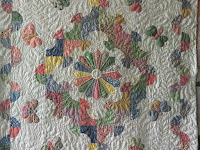 Of course it's hand appliqued and hand quilted. Of course my Christmas decorations follow my blue-green theme. I had made a Christmas runner a long time ago that had red, blue, green, and gold in it, and it served its purpose well for a long time. This past Christmas I decided it was time to make one in my true colours. I love door wreaths ... especially the ones made from many different Christmas balls, so I used this as inspiration for my Christmas runner. In my guild there are a few members who have hired me to hand quilt their quilts. 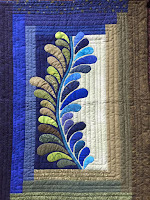 One lady in particular has gotten me to do quilt a few of hers, many of which have ended up in our quilt show. I finished this one for her the end of January. I don't know what she's calling it. 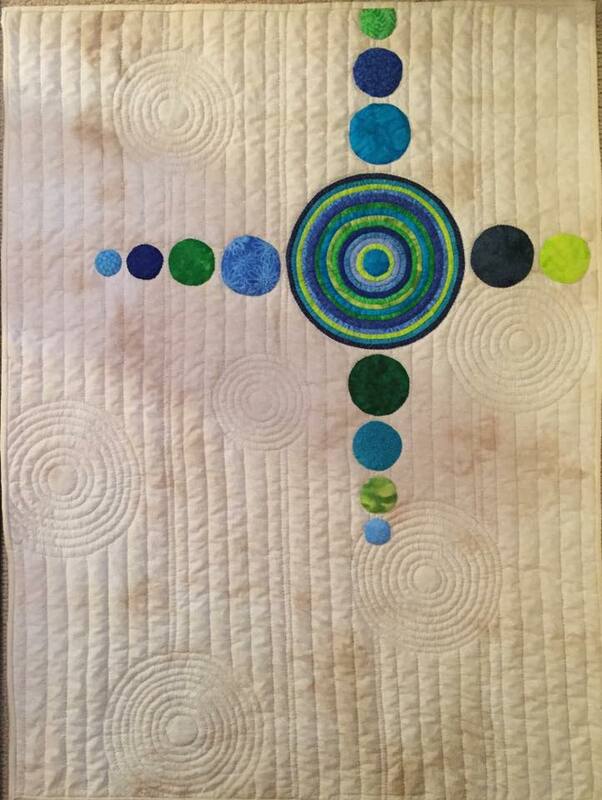 She hand appliqued the whole thing, then I quilted a cross-hatch throughout the center and straight lines around the borders. It's a queen size quilt. As soon as I finished that one I got another customer quilt to work on. 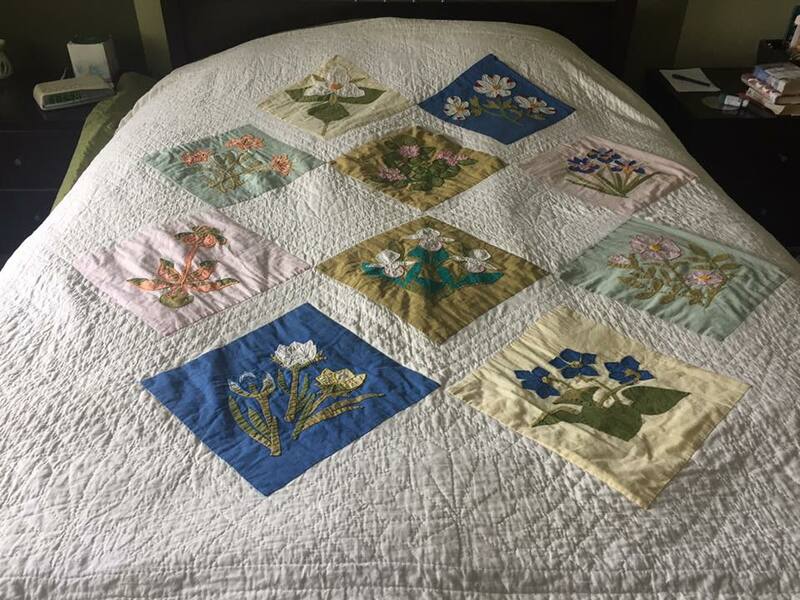 Besides handquilting for others, I often get jobs restoring or repairing old or worn out quilts. This one's an antique, likely made in the 1930's or 40's. It has the flowers of all the Canadian Provinces appliqued onto blocks, which are then appliqued to the background. 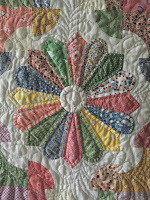 Some of the flowers are also blanket stitched in great detail. The green border was completely shredded along 2 sides. The owner wasn't overly concerned with retaining the historical integrity or value of it, she just wanted it to look good and be usable. It was in pretty good shape, considering its age. 3 of the blocks had been removed, but she had them for me to reattach. There were also a few bits of thread in the background where those blocks had been, so by colour of the thread I could tell which block went where. 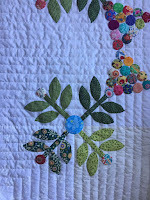 I reattached the loose flowers on all blocks that needed it, re-appliqued the 3 blocks, then got to work on the border. 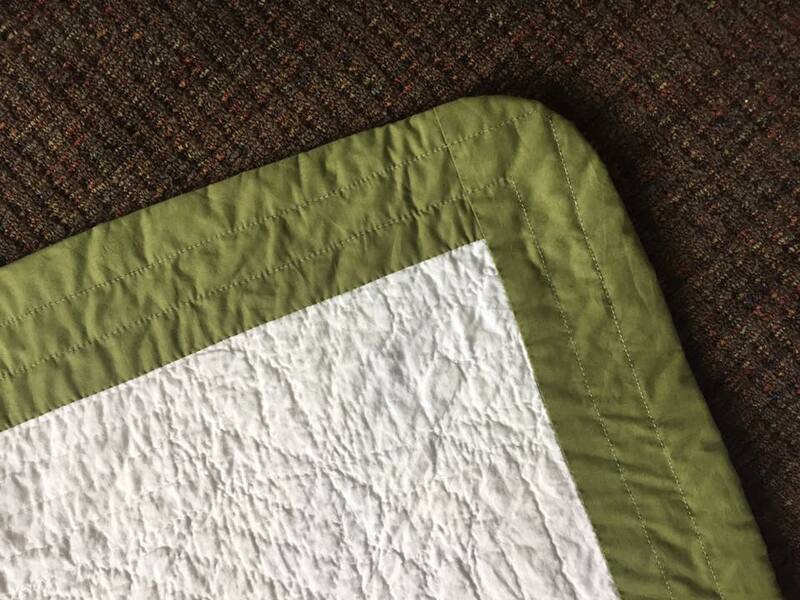 Even though she wasn't picky about the historical part of the quilt, I really wanted to find a green that matched the border as closely as possible. 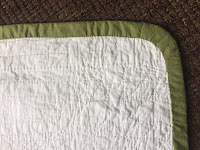 I took one of the loose blocks with me to the fabric shop and although they didn't have anything that resembled the border green, there was an exact match for a slightly darker green used in the blocks, so I got that instead. 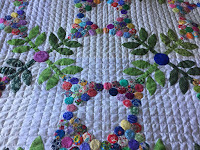 I appliqued the border (over the old one) to the front all the way around, then flipped it over and blind-stitched it to the back exactly as the original was done. 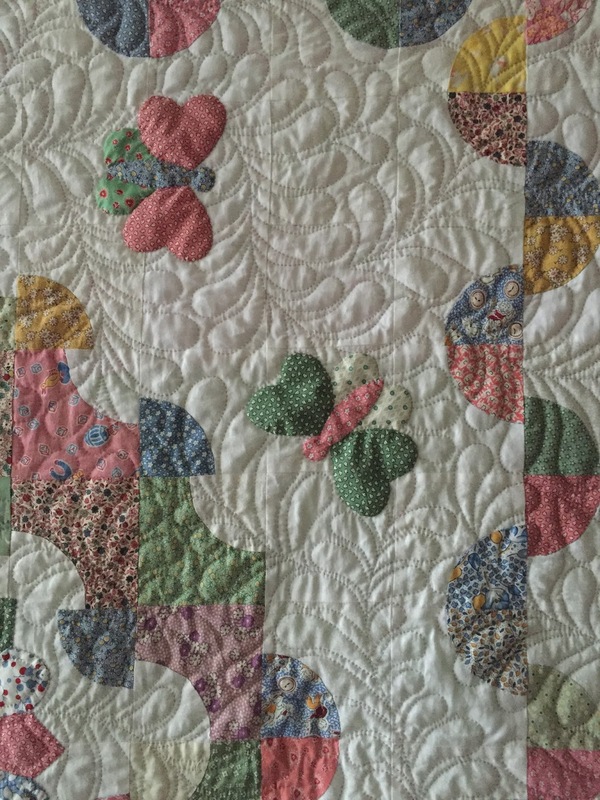 Any time I have to replace blocks in an old quilt, I never remove the old ... 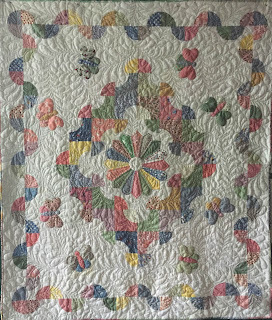 I cover the old with the new so that the work of the person who originally made the quilt is preserved inside. 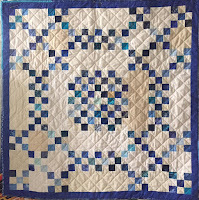 I finished off this one by hand quilting a couple of lines through the border as the original border was done. 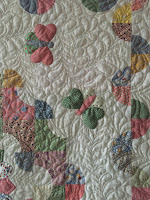 Here you can see the finished quilt, with the repaired border and the back side of the border. So, work quilts completed and I'm back to my own stuff. Here we go again with my blues and greens. I started out with a centre that was half blue, half green, connected by a wavy line. I added borders to it in a Courthouse Steps design, doing top/bottom, then side/side until it was the size I wanted. 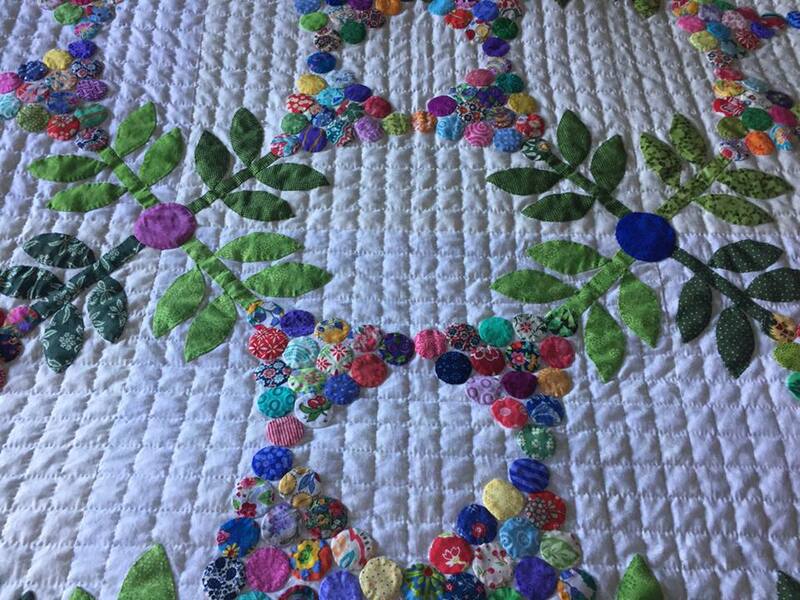 I put a teal strip down the wavy centre, then appliqued green feathers to the blue side and blue feathers to the green side. I hand quilted it with variegated blue thread on the blue side, variegated green on the green just radiating rectangularly (yes, that's a word .... now). It's 22" x 30". Just last night I finished this one. A few years ago I had created a runner in red and white for Chinese New Year, named it Gung Hay Fat Choy. The circles are meant to represent coins, and red is considered a lucky colour in Chinese culture. I've since made the same pattern in a 30's repro version and another in green, both sold almost immediately. This time I did it in blues. The pattern is available for purchase here.